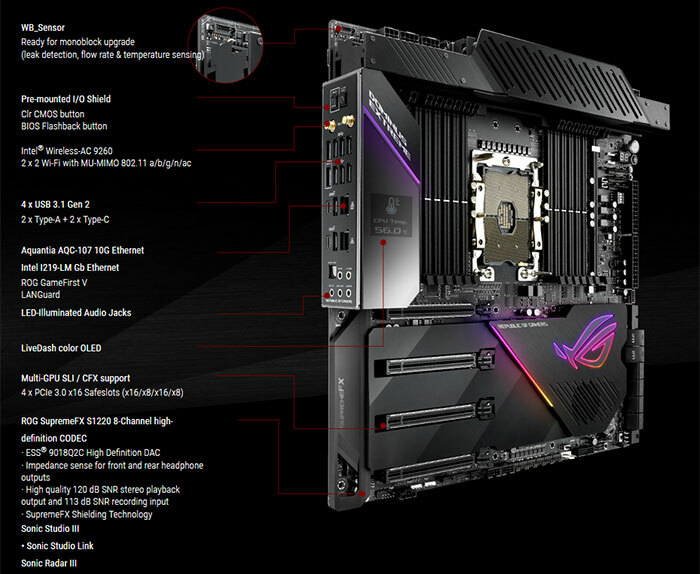 Asus launched the ROG Dominus Extreme motherboard last week, and the official product pages were published at around the same time. Despite Intel's Xeon W-3175X launch statement, asking would-be users to enquire with OEMs and systems integrators if they were interested in the platform, it has now become apparent that these Xeon processors and associated components will become available directly to PC DIY enthusiasts. At the weekend Tom's Hardware reported upon US dollar pricing of the Intel Xeon W-3175X (US$2,979) and Asus Dominus Extreme motherboard (US$1,800). Now another source, CotCowLand, has noted that the Asus ROG Dominus Extreme has been listed at CAD$2347. Both US and Canadian sourced motherboard prices are equivalent to about £1,400. As TPU comments, this could make the Asus ROG product the most expensive client segment motherboard in history. 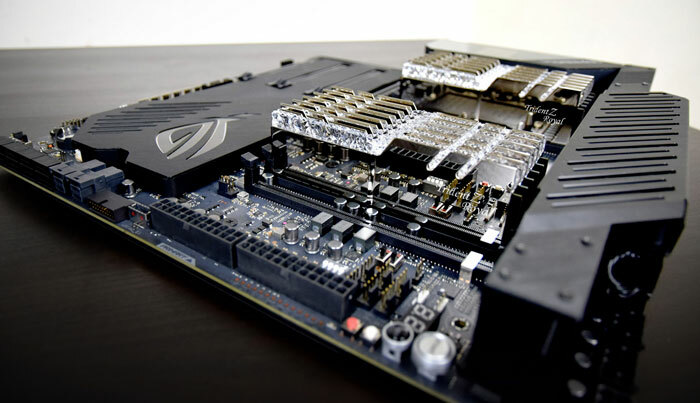 You can read more about the Asus ROG Dominus Extreme on the ROG news blog. In summary, it is designed in the 14-inch square EEB form factor. The processor socket is flanked by 12x DDR4 DIMM slots, supporting up to 192GB of RAM. Elsewhere on the board there is support for up to four NVMe SSDs and there are four PCIe x16 slots too. High end 10Gbps LAN is on-board, as is Wi-Fi 5 (802.11ac) capability. 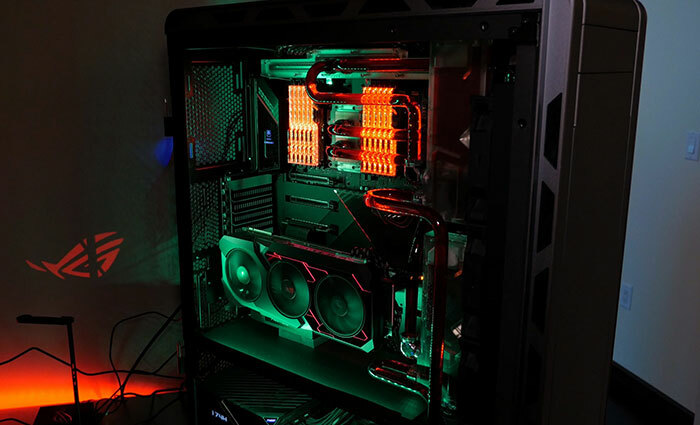 Overclocking is catered for with Auto-Tuning and FanXpert 4, and 14x PWM fan headers allow for plenty of cooling system-wide. Last but not least there is an eye catching 1.77 inch colour LiveDash OLED display on board for system info etc. If adding the expected prices of the Intel Xeon W-3175X and Asus ROG Dominus Extreme isn't enough to worry your wallet, another major cost for a fully configured system will be in the hexa-channel RAM kit you deploy. Last week we saw G.Skill launch its hexa-channel matched Trident Z Royal DDR4 RGB kits in capacities up to 192GB which will surely cost a right royal sum. One has to wonder what Intel are trying to prove with this entire platform. So far (with rough numbers) the motherboard + CPU would cost at least £2,400 more than the Threadripper 2990wx + motherboard. Even if it is marginally faster, is that worth £2,400+ more? With £2,400 you could build an entire mid-range gaming PC! This isn't for people that are worried about 2400 quid. I don't know people who buy just one workstation. The rule is the PC shouldn't keep the expensive to hire engineer working on it sat around waiting as that is really expensive, but it's hard to think of a task where this makes economic sense. Even if you could make the raw price/performance make economic sense, the fact that this is a very new and low volume platform might still put people off. I'm sure early adopter glitches would be even less welcome in a very-expensive-engineer environment - at least TR4 has had a couple of years out in the wild so you can be fairly sure of what you're getting. Still, new and low volume certainly isn't an argument that will put the e-peen crowd off so I'm sure they'll sell a few.